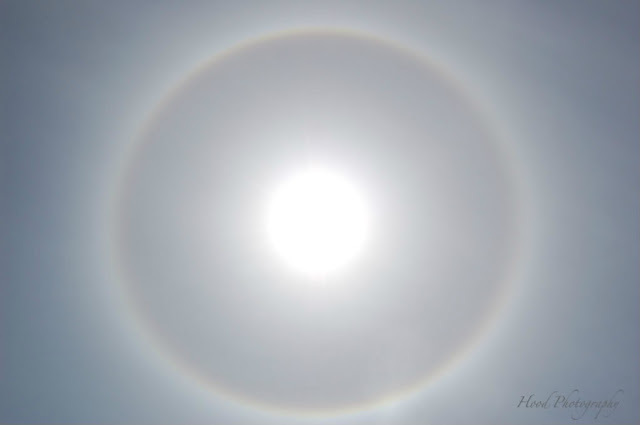 What does a ring around the sun mean? My mom says it is a change in the weather, and I believe her. Within an hour of taking this blue sky photo of the sun, the clouds rolled in and it has been overcast and raining on and off since! Wow! What a shot! Yes, I've always heard that a ring around the sun signals rain...hope it doesn't last too long! Wicked cool photo! I love it. I have always been told this is a 'sun dog.' A similar sight around the moon, would be a 'moon dog.' They are formed by ice crystals high in the atmosphere... nicely captured. If you fancy another photo challenge, I have one running on my blog every month (on the 5th). It's called '5 on the fifth' and it is only a few days away. This months sees the 25th month of this little photo challenge! Oh, WOW! An amazing shot it is! Terrific! Enjoy your weekend, Sarah!! These are always fun to shoot if you are careful! Try on your wings and find out where it's at! Grateful Dead, "the golden road to unlimited devotion".